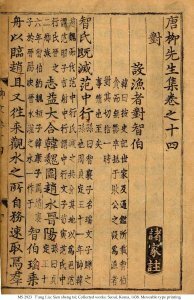 Description	 Moveable type printing in Chinese on paper, Seoul, Korea, 1438, 43 ff. (complete), 35x19 cm, 15-17 columns, (26x17 cm), 18 characters in Chinese book script Kabin-Ja type. Binding	 Korea, 19th c., embossed yellow paper covers, stitched on 5 stations (Xian zhuang). Context	 For a single leaf printed in the same moveable type, see MS 2765/2. Provenance	 1. Lee Gyum Ro, Tong Moon Kwan (his bookshop), Korea (1961); 2. Melvin P. McGovern (ca. 1961-); 3. Widow of Melvin P. McGovern; 4. Sam Fogg Rare Books Ltd., London (1999); 5. Bruce Ferrini, Akron, Ohio. Commentary	 In 1434 the Publications Office was ordered by the king to cast a bronze font of 200,000 pieces of type which was named Kabin-Ja. This momentous event in Korean typographical history is recorded in the Yi Dynasty Annals and in the Third Foreword to the Yoktae janggam bakui of 1437. These accounts state the king, regretting that the type in use, though beautiful, was difficult to read because of the small size of the characters, suggested that a new font be cast from written characters of a larger size. Within two months more than 200,000 were cast, so clear and exact that is was possible to print more than forty sheets per day. 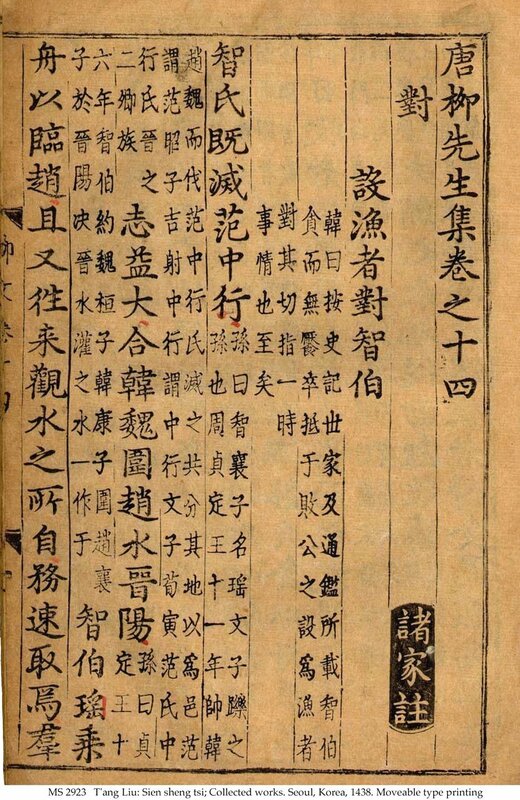 The style of the characters is that of the early Ming calligraphers. Kabin-Ja is sometimes called Wibuin-Ja, or type in the Madame Wi Style, which is the Korean name for the Chinese style of writing of that period.